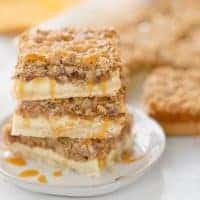 A triple layer of apples, cheesecake and crumb coat make these apple crumble cheesecake bars a different take on a classic fall dessert. A lot of you were asking for this recipe here on my site so I am sharing it below. 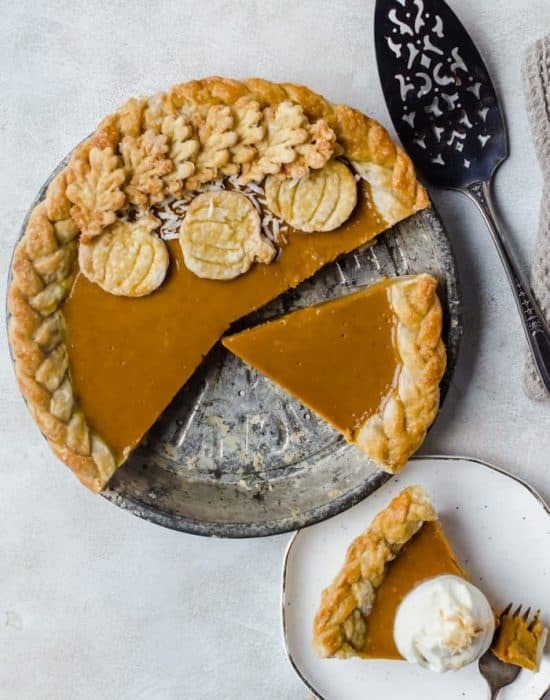 This post was meant to live over on The Spiffy Cookie but I understand you want one less click to get this yummy fall recipe. 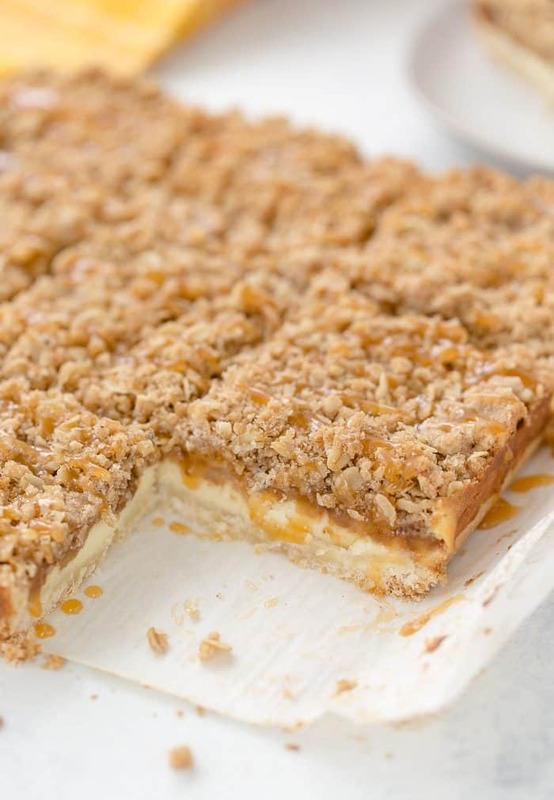 Nothing beats the combination of warm apple pie filling with a crumbly crunch topping and a sweet cream cheese layer. 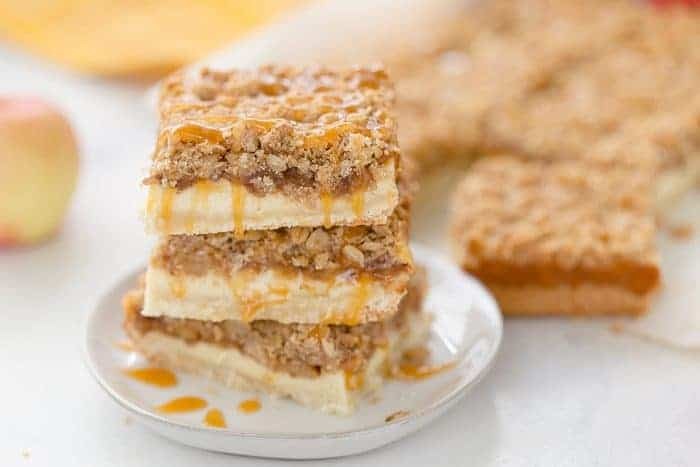 These apple crumble cheesecake bars are always a hit when I bring it to the office and one you should definitely add to your fall baking list! The original post is still below. When you start writing posts under a quilt, you know fall is REALLY here. And with the nice fall weather comes apple season and apple baking!!! I jumped the gun a little last week by starting with pumpkin but that was due to my addiction to pumpkin spice latte (so not sorry!). So this weekend I caught up with apples that are actually in season and I baked up a storm. 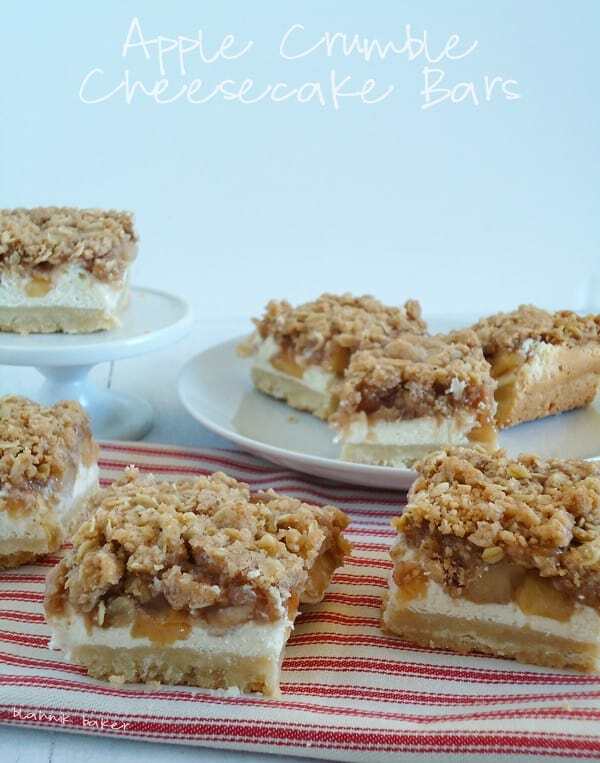 First up on my apple baking list were these apple crumble cheesecake bars. They were inspired by a streusel bar I bookmarked a while ago in Betty Crocker The Big Book of Cookies and I’ve been waiting for apple season to experiment with them. I layered the cookie crust with a cheesecake filling, a homemade apple pie filling and topped with a cinnamon crumble layer. They are simply good and addicting. 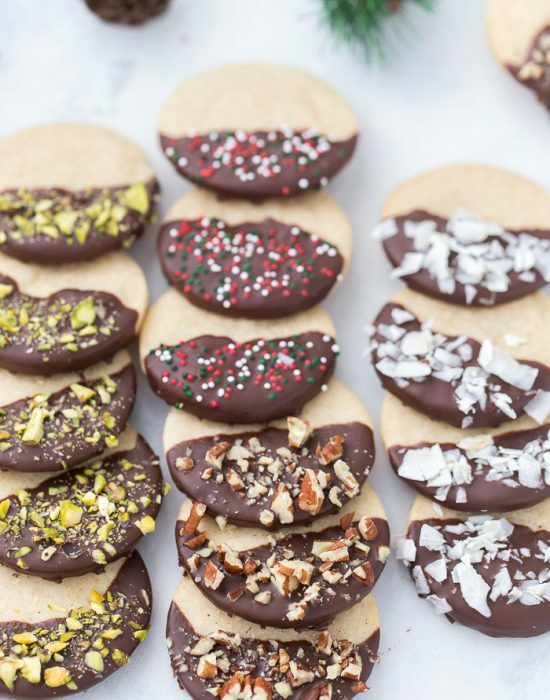 My friend Erin, of The Spiffy Cookie, is defending her Ph.D. thesis in a week and I am over there today sharing this new fall favorite with her readers. Head over there now to get the recipe for these apple crumble cheesecake bars. Heat oven to 375 degrees F. Line a 13 x 9-inch pan with foil and grease. In the bowl of an electric mixer, combine all the ingredients for the crust and mix on low speed until coarse crumbs form. Alternatively, you can stir all the ingredients in a large bowl until coarse. Press the crumb in the prepared pan and bake for 15 minutes or until golden brown. Let cool for 30 minutes. 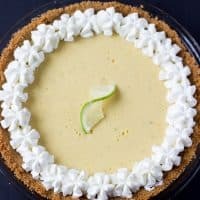 Reduce oven temperature to 350 degrees F.
To make the cream cheese filling, combine the cream cheese, sugar, flour, extract and egg in a large bowl. Beat until smooth on medium speed using an electric mixer, about 3 minutes. Spread cream cheese filling over cooled crust and smooth evenly. Spoon apple pie filling evenly over cream cheese layer. Make the crumb coating by combining all the ingredients, except cold butter in a medium bowl. Mix in butter with your fingers until crumbly. Sprinkle the crumb coat evenly over the filling. Bake for 30-40 minutes or until golden brown. Remove pan from oven and let cool for about 30 minutes on a wire rack. Chill for at least 2 hours to set. Remove bars from pan by lifting foil overhangs. Cut into bars. Wow, I can see the layers so clearly! Cheesecake, apples, crumble, crust, its all there! They look decadent and delicious! Thanks Mary! All came together so well. Loved it! I am going apple picking this weekend and can’t wait to start baking with apples! 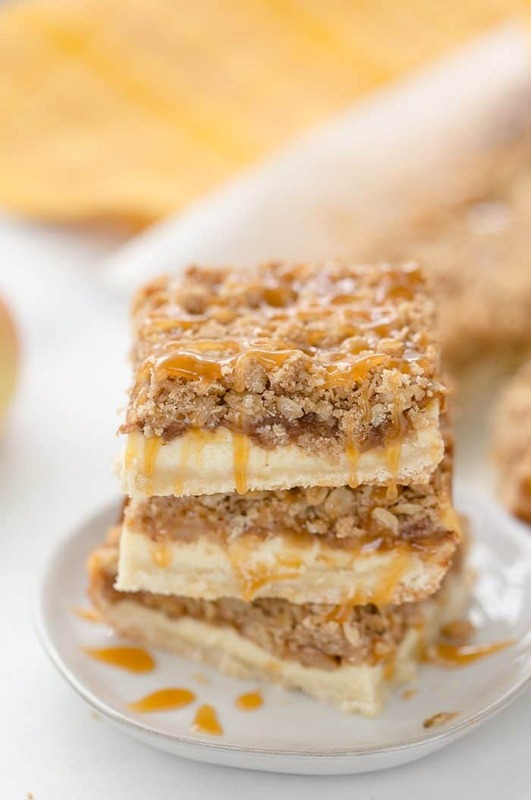 I need these apple cheesecake bars now!! I was supposed to go this past weekend but I was too glued to my couch watching Orange is the New Black so I am shooting for the coming weekend! I need to load up on apples asap! Love these bars! Gah – these bars look fantabuous!!! 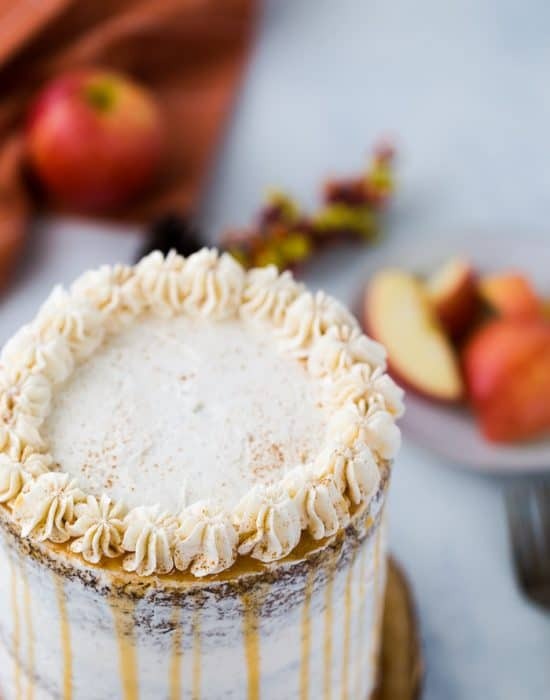 The apple layer, the cheesecake, the crumbs, the crust – so clearly marked and each one looks so delish! I have had a recipe pulled out of a magazine for something like this. I have been hanging on to it for years. These look delicious! I am going to have to give them a try. Jamie, it’s time to give it a try 🙂 I’m sure your kids would love it! It was totally goooood!! Was a surprisingly great breakfast too! Eeeeep, that’s my goal lol! Wow, these look amazing! Stopping by from the Tasteful Tuesday at Naptime Creations link up. Have a great week! These look delicious!!! Thanks for linking with us for WDW!! This looks fantastic! I can’t wait to try it! Definitely pinning! 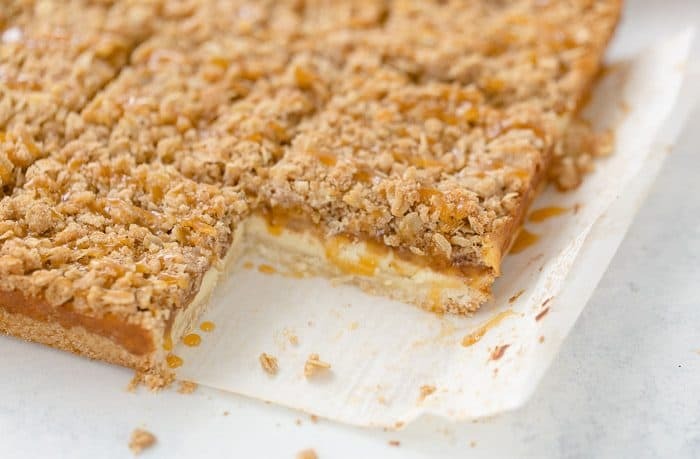 These cheesecake bars sure are something special, especially with that crumble! YUM! Heather!! Now that’s some crazy talk. We are saying we want some California weather here. Maybe trade places?? I know it’s fall when my sweat pants come out…that is all that will fit with all the eating I plan to do! I love apple treats, but rarely make them! I’ve been seeing so many great recipes and this looks like another success! These look fantastic — like a sweet and spiced combo of apple pie and cheesecake. What could be better?! I always love cheesecake, and my husband is always looking for an excuse to eat an apple. I’m sure these would be a bit hit in our household. Thanks for sharing! Jamie, they are indeed a sweet and spiced combo of apple pie and cheesecake!! I’m sure you two will enjoy it :). Thanks for visiting! If only I could figure out how to bake and cook under a quilt, I’d be set for life! It is FRIGID here. Holy yum, Zainab! I love how buttery and lovely that crust looks, especially piled high with cheesecake and apples. When fall hits, I want to put crumble topping on pretty much everything! Hopping over to The Spiffy Cookie to check out the recipe! Thanks Amy!! I am doing the same here…made like three recipes all with crumble toppings. New follower. Found you over on the Showcase Your Talent Thursday hop. These look so yummy. Can’t wait to try them. Thanks for sharing. Have a great day!!! Hi Ashley. 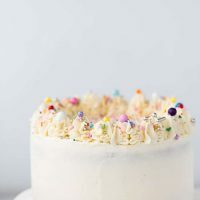 Thanks for the follow 🙂 I hope you find a few recipes you like! We are going to spend this weekend making apple juice and who knows maybe some of these as well. Homemade apple juice?? That’s amazing. I am attempting apple picking this weekend so I’ll be swamped with apples too. I cannot stop browsing your blog! All of your recipes look delicious. 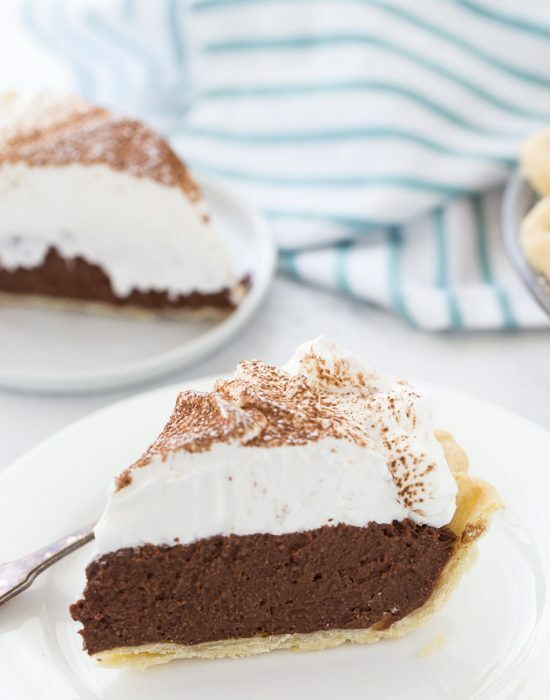 I can’t wait to try this one, because it combines two of my favorite comfort desserts. Now, find a way to smash some chocolate cake in there and we’d hit the trifecta! PS: I will accept your challenge!! Let me see how chocolate cheesecake and apples will go. Thank you very much Krista. I haven’t tried Sopapia cheesecake bars before but they sound like I would love them! These look perfect for my sweet tooth. Thank you for sharing! Hi Zainab! Visiting from Show Stopper Saturday – had to take a look at your cheesecake bars. They look amazing! Also, your photos are top-notch. Pinning these for sure! These look SO amazing!! I went apple picking today and these are definitely on the menu tonight!! I am heading apple picking tomorrow and I can’t wait to make more apple recipes. Hopefully you try this! Apple streusel and cheesecake filling? Yum. 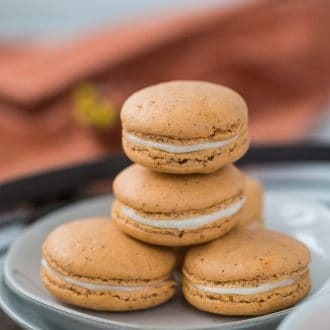 These are going on my fall baking list for sure! 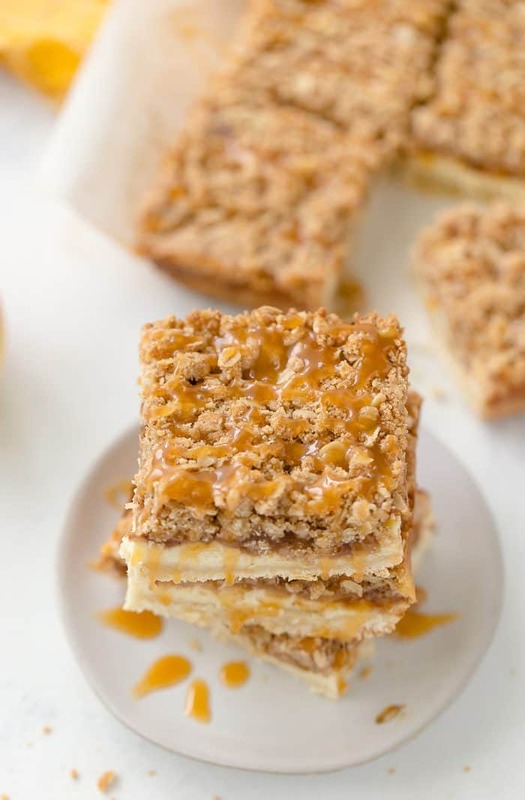 Love these cheesecake bars! 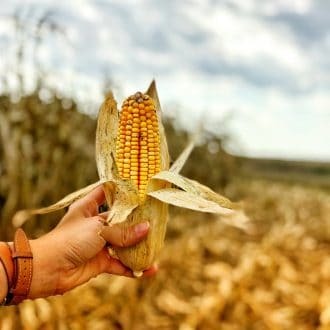 Thanks for linking up What’s Cookin’ Wednesday! Oh boy, do these every look incredible! I think my hubby would flip over these sweet treats! Visiting from SITS today. Oh these sound lovely! I’ve been cooking with apples all day today. My name is Katie and I host Fall Into the Holidays, open Saturdays. I would love to have you link up! Thanks Katie for stopping by! I’ll stop by the party. WOW! These look AMAZING! Thanks for sharing, I am so glad I found you on Show Stopper Saturday Link Party! Oh how I wish it was blanket weather here in FL! Yesterday it was in the 90s. Ahhhh! These look so good, Zainab! Pinned! These look so yummy! 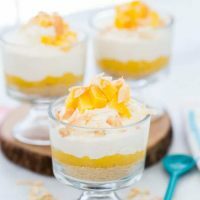 🙂 I have a feeling that my husband who is a lover of apple pie and cheesecake would love these! Carrie thanks for hosting every week!! Yep!!! 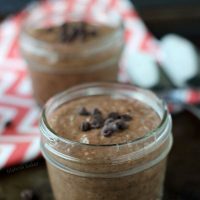 I think I better make these soon! Looks fab! Thanks for sharing at Sweet & Savory Saturdays #31. These look absolutely delicious! The layers are beautiful! 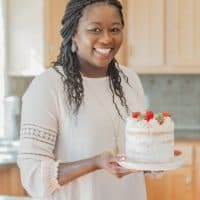 How do I save your recipes so I can make them? My printer doesn’t work. Jackie, I use Ziplist on all of my recipes. 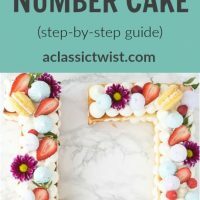 If you are on a post that has a recipe (this one doesn’t because I was guest blogging for a friend), there is a save recipe button on the top right of each recipe card. All you will have to do is create an account with ziplist and save the recipe there in your recipe box. It’s a great service and I use it for all the recipes I want to save for later. I hope this helps. If not feel free to shoot me an email, I’ll be happy to help.